One of the first things I made for my new co-workers were these sweet potato cranberry orange scones. They are so delicious, light and jam packed with flavor. One of my new colleagues even said they were the best scones she has ever had. If you like cranberry orange, they are definitely worth a try. You could also make them with canned pumpkin if you have it on hand instead of sweet potato. Either way, give them a try as they will not disappoint. Adding the cranberries to the dry ingredients. Wet ingredient folded into the dry. Brushed with egg whites and topped with brown sugar. Then into the oven! 2. In a large bowl, stir together flour, sugar, baking powder and salt. Add butter, and using a pastry blender or your fingers, blend butter quickly into the flour, until butter is pea sized. 3. Add egg yolks, and stir until combined. Then fold in the halved cranberries. 5. Transfer dough to large cutting board that has been lightly floured. Form dough into a square and roll out until it is about 1 inch think. 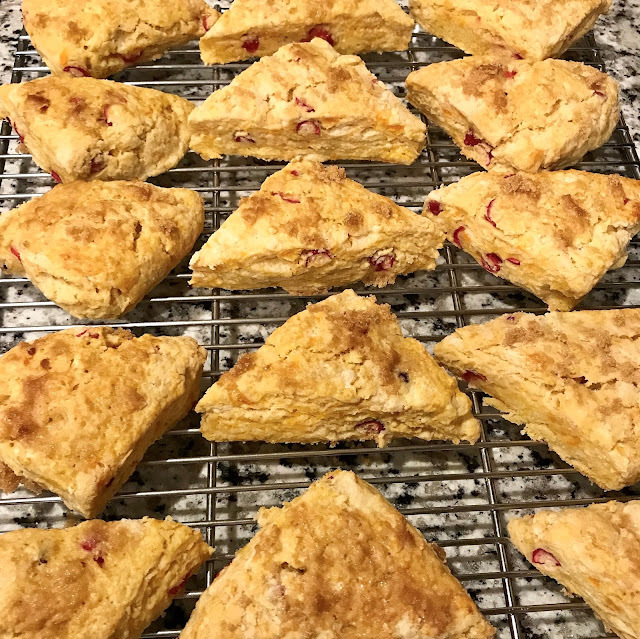 Cut scones into desired shape/size. Place on prepared baking sheet. 6. Beat the egg whites just until foamy. Lightly brush the tops of the scones with the egg whites, and then sprinkle the tops with brown sugar. 7. Bake in the preheated oven for 22 to 24 minutes, until lightly browned. Transfer to wire rack to cool. Best served on the day they are baked, but can be stored in an air tight container for a few days. Enjoy!